Jogging route manners your need to know when running around Tokyo Imperial Palace to avoid getting inspected. Things to do in Tokyo that feed your heart brim. Jogging around Tokyo Imperial Palace is big on things to do in Tokyo. Whether you are a Tokyo-Metro resident is not the place where the emperor of Japan seems like an exotic place to go running. However, all's fun and games till you make a mistake. Where is a good place to go jogging while you are in Tokyo? As you can see from the popular Tokyo marathon, marathon boom has spread across the country as the Tokyo metropolitan area. 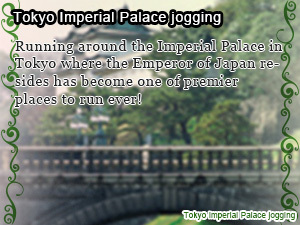 We often hear the term jogging Imperial Palace, Imperial Palace Runner in recent years. Surveys around the Imperial Palace (around Sakuradamon), the runner of 4,500 people have been confirmed for three hours at 18-21. People who want to start a run now, even if it is not fan boy, the Imperial Palace are running Interested in? In today's Slism we will be discussing all you need to know to map your jogging route around the Tokyo Imperial Palace adding just one more thing to do in Tokyo to your list. 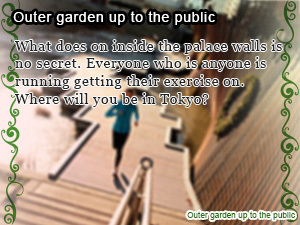 Tokyo Imperial Palace Outer Garden Has A Running Route? Though it is a shorter course in which even about 3.1 miles beginner challenges easily 1 lap, running can be enjoyed facing spots, such as Tokyo Tower, a Maru-building and the Tokyo National Museum of Modern Arts, Crafts Gallery of The Tokyo National Museum of Modern Art, British Embassy, Hanzomon, the National Theater, and Sakuradamon. It could also be called one of the pleasures of an Imperial-Palace run to enjoy a scene. In addition, there is no signal because there is no traffic signal. Also that it can run without stopping, it would be one of the points to runner thankfully. 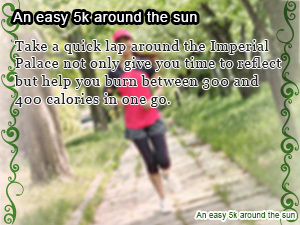 Since there are a water supply spot and a space which takes a toilet and a break, a jogging can be enjoyed in comfort. Although when the course was founded it was necessary will be just to run around It is a free sidewalk even if it calls it a course. There is no rule "it must run toward which direction." But although it turns out that it actually runs, since the counterclockwise rotation is recommended, most persons are running counterclockwise. (Probably, it is good to avoid the time of rush hours, when saying that he would like to surely run clockwise). Although it was also in advance, since the course of an Imperial-Palace run is a free sidewalk, there is not necessarily a regular start point. Since there are many people who begin a jogging after depositing a luggage in a public bath or a coin locker, the start point changes in each with places in which a luggage is deposited. Moreover, the running stations (service of a custody of spare clothing, and a shower and a load, instruction of form, etc. is provided) which support an Imperial-Palace runner around the Imperial Palace have been increasing in number recently. Probably, it is good to make a near place into a start point from a running station, when using a running station. Although start points differ to each runner, the open space in front of Imperial-Palace Sakuradamon has the open space and clock tower which can perform warming up and cool down, and serves as many runners' start point. Except for midnight, many runners are running Imperial Palace Outer Garden. Midsummer's Day, but it is not the time zone is suitable for running hot, about the other seasons, think you may enjoy running your own convenient time zone. It seems that there are also many people who aim at a vacant time zone. Running by one woman at "night is worried just for a moment.... "Many person there and, in Imperial-Palace running, as for night, there are many female runners. Probably, it is a safe reason night also that there are many that the circumference of the Imperial Palace has comparatively many police boxes, and has them, and a guard is in several places, night, or runners etc. If it is running of night, there is also a merit that it is not necessary to care about suntan. Sweating On the Train Ride Home? Probably, unlike running around a house, there are also many people who have to return from the circumference of the Imperial Palace to a house by train such as those who have run before going home from a company. Although introduced also in advance, there are many institutions which can take showers, such as a public bath and a running station, and they are around the Imperial Palace. After changing one's clothes at a running station, depositing a luggage, and going to run on the way from the office and running finishing, it returns to a running station, a load is received, and the salaried worker of exposing and going home also often sees a shower. Imperial-Palace running is not only a person with a near house. Even if a house is far, since there is an institution which can shed sweat, it is reliable. A person to the person of the skirt for running and the ordinary jersey upper and lower sides which are increasing to the woman of the dress of the runner who runs Imperial Palace Outer Garden who wears full-scale wear like what you would wear running a marathon is various. Although there may also be a person of "entering from a shape", it will seldom be necessary to care about a shape. Probably, it will be more important than appearance to make it not have a bad influence on condition with a dress, such as that it is a dress suitable for climate or to use the material excellent in breathability. What Do If You Get a Thirsty Mouth In The Middle Of Exercise? Although I can have a luggage checked in a locker, the public bath, etc., what should we do with a drink? It is anxious about putting on somewhere after all. Since a drinking fountain is located in some places, let's check before beginning running. When running with a drink, it is good to use a running bag and a waist pouch. Since many persons, such as not only a runner but a pedestrian, a bicycle, a tourist, are in the circumference of the Imperial Palace, a runner's manners become very important. Run counterclockwise to fit in- That what it's made for. Everyone is doing it so you should too! Call it when overtakingthe person in front of you - Coming through! No clotheslining people from behind- Don't to spread when running in a group. Do your best to stay out of the way - Neither cool-down nor talking while standing closes a way. Wear headphones - The volume of a music player is cut down. Give it your all- It runs with the heart of consideration. Although there are a lot of ways to call out your fellow runner when passing, you don't want to be rude saying something like "get out of the way, coming through (zoom)" No, all you have to do is tell the person in front of you loud enough so that they can hear you, "I'm coming at your left!" When you overtake, you can prevent contact by "going along the right side" from behind, and calling out to others. It is a serious thing to warn the rear. “Don’t forget your manners”, your mom would always say. If she only knew how right she was. In order to be a productive member of society in today’s adult world, you must practice good manners. Forgetting to display common courtesies shows other people that you are not worth their time. In order to be accepted as a responsible adult you should consider following these 12 rules of etiquette. Do you consider yourself a free-spirit? Then trail running is right for you. Let your body, mind, and soul be taken in by nature as your diet and exercise program turns green. Running around the Imperial Palace in Tokyo where the Emperor of Japan resides has become one of premier places to run ever! What does on inside the palace walls is no secret. Everyone who is anyone is running getting their exercise on. Where will you be in Tokyo? Take a quick lap around the Imperial Palace not only give you time to reflect but help you burn between 300 and 400 calories in one go.